Allende (CV3) -- Light gray crust studded with unablated chondrules. 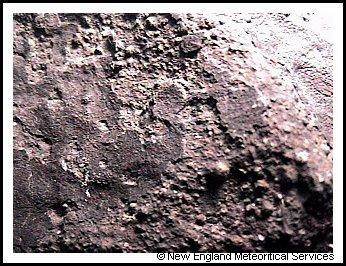 Fusion crust on carbonaceous chondrites tends to "flake" leaving uneven surface as seen here. Imilac (PAL) -- This is an old fall. Any fusion crust on this specimen has been eroded by the dry, abrasive winds of the Atacama leaving olivine crystals exposed. Click any image for a JPG enlargement. 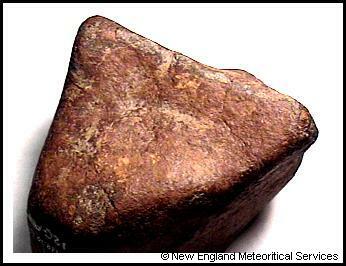 Fusion crust is one of those meteoritical terms so simply defined that most of us look no further into the process and rush off to the more exotic chondrules, clasts, and interstellar grains. While the charred exterior surface is seemingly simple in formation, it is the end product of an extremely complicated and violent phenomenon. 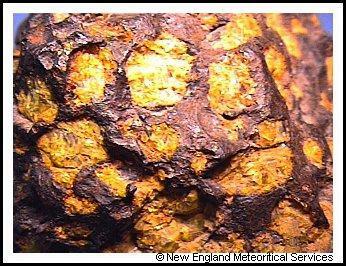 Dimmitt (H4) -- Brown, oxidized crust; the result of long term terrestrial weathering after surviving a high energy plunge through the atmosphere. Objects approaching Earth possess enormous amounts of kinetic energy. Frictional heating during atmospheric passage converts this energy to a minimum of 15,000 cal/gm at 11.2 km/sec due to the acceleration of gravity and up to a maximum of around 600,000 cal/gm at 72 km/sec. Objects moving faster than this are ejected from the Solar System. To put this into perspective, the energy needed to vaporize water is 540 cal/gm and is 13,000 cal/gm to vaporize carbon which has one of the highest known vaporization temperatures. But meteorites are made of thermally "softer" stuff, and if there is more than enough energy to vaporize carbon, how can there be meteorites on Earth? Why don't they vaporize during atmospheric passage? 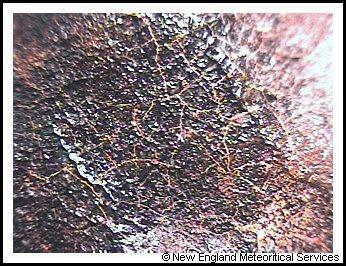 Buschoff (L6) -- A thick (1 to 2 mm) black crust created during incandescent flight, while material only slightly below the crust is unaffected by heat. Complete vaporization is exactly what would happen if all this kinetic energy were converted into thermal energy within the meteoroid. But surprisingly, instead of going inward, most of this thermal energy is transferred outward into the surrounding air through a complex process called gas dynamic drag (the thermal effects of gas in motion). This process ultimately defines a "partitioning" of the heat energy into several areas: heating of the meteoroid, vaporization and ionization of the melting material, heating the surrounding air mass, and most importantly, to the meteoroid's survival, surface melting. To further appreciate this process, we need to take a ride. Moving toward Earth our meteorite-to-be is cold. Its entire stony mass of 3,600 kg is cold-soaked from the temperature of space to minus 100° C. As it approaches with a relative velocity of 5 km/sec, Earth's gravity will accelerate it to 17.2 km/sec. At one hundred and forty kilometers above the Earth's surface, it begins to encounter the atmosphere but the density is so low that little, if any, drag occurs. Three seconds later, what began as a gentle descent now turns violently disruptive. Murchison (CM2) -- Note the "folded" layer on the back side of the oriented surface where molten material has flowed around the edge of the meteorite. Falling below 100 km, it's starting to glow. As the atmospheric density rapidly increases, velocity decreases through drag. The air around our 1.2 meter diameter meteoroid is becoming incandescent as surface material melts and vaporizes from the heat of friction. The resulting mixture of ionized, burning gas and dust creates a fireball over 100 meters across offering a brief but spectacular visual display to anyone below. As it falls through 80 km, it loses 3 to 6 mm of surface mass per second through ablation. The melted material and metal, heated to over 1800° C, is being swept away from the meteoroid, carrying away the accumulating surface heat so efficiently that the interior remains cool. 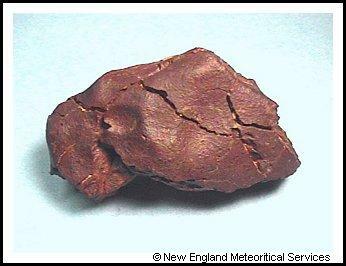 Some of this molten material may be redeposited in "folded" layers along the rear side of the meteoroid (see Murchison photo), but most of it vaporizes and then condenses upon cooling leaving a dust trail. While ablation is not a smooth process, it's mild compared to what happens next. Estherville (MES) -- An interesting mix of crusts  silicates and iron both fused together. 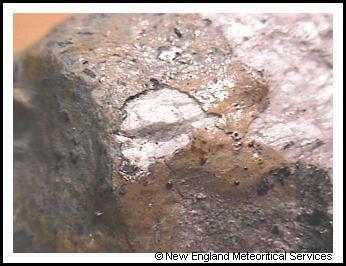 A section of metal was beginning to tear away from the main specimen as a result of rapid deceleration in the atmosphere. 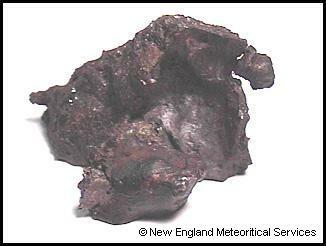 From 100 km above the Earth down to 60 km, our meteoroid loses around 70% of its cosmic velocity. This rapid deceleration can be more disruptive than ablation. Large chunks of material are ripped from the melting surface as the meteoroid violently decelerates at more than 300 times the force of gravity. With the surface melting slowing down, staying intact becomes the next problem for our meteoroid. However, it begins to separate along a fracture that occurred from impact in the distant past. Now two distinct objects, our meteoroids continue melting down to 30 km where they finally lose their cosmic velocity, stop ablating, and begin the slower "dark flight" part of their fall. The formation of fusion crust is over. Camel Donga (EUC) -- These fine lines of contraction cracking ultimately result in an increased rate of terrestrialization from moisture soaking into the matrix. 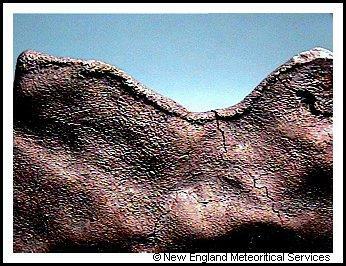 During dark flight, which occurs after the extinction or retardation point, the meteoroid's surface quickly goes from being molten to very cool causing contraction cracking in the now solidified crust (see Camel Donga). After falling the last 20 km, the two objects weighing 120 kg and 240 kg become meteorites, hitting the ground cold after losing 90% of their mass (some meteorites have actually been reported to "frost" over on the surface due to their still cold interior). Norton County (AUB) -- Low iron, tan crust. 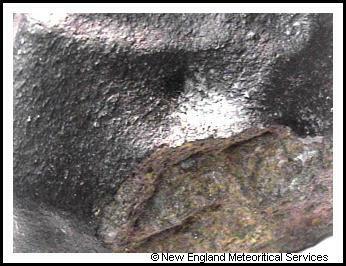 Note the impact point where this meteorite stuck the ground dislodging some of the crust. After all of this it should be clear that fusion crust is the melted surface layer of whatever remains when ablation stops. It is composed of oxides of iron and since fusion crust is a melted representation of the interior silicated mineralogy, the color would seem to be a function of its iron content. Generally, the more iron present, the blacker the crust. Norton County and Pena Blanca Springs, iron-poor enstatite achondrites, have a "cream" colored crust. 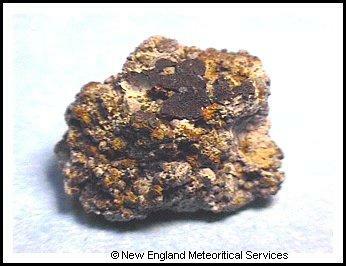 The crust on iron meteorites is similar, however, it is a bluish-black color. Eucrites produce a shiny black crust that differs from the somewhat duller, black crust of chondrites. However, after a period of time here on Earth all fusion crust loses its luster from weathering and becomes dull, frosted-like in appearance. In moist, temperate areas of the Earth, the crust can degrade over a period of a few hundred years. Desert and Antarctic localities offer the most stable environment (see Mulga photo), although once an Antarctic meteorite moves up through the ice to the surface, wind erosion takes its toll (see Antarctic photo). Fusion crust is a lesson in physics. Spend some time on this one. The chondrules, clasts, and interstellar grains will still be there. Mulga (H6) -- Weathered fusion crust that resembles leather. Wed look like this, too, after 30,000 years in the Australian sun! Antarctic UNCLAS Stone -- Small bits of crust amid matrix material that has been highly eroded by the icy Antarctic winds. Author's note: The physics of the fall is enormously complex and only superficially treated here. Acknowledgements: Special thanks to Tim Grove, Massachusetts Institute of Technology and Carl Francis, Harvard University. This article has been reprinted from the November issue of METEORITE! Magazine, Pallasite Press, with the permission of the publisher and the author. International copyright laws apply.